While gold and silver bullion coins have long dominated the minds of precious metals investors, platinum coins are gaining popularity in the 21st century as more mints turn to this metal for a third option to provide investors. Several major mints offer 1 oz platinum bullion coins. Right now, you can purchase a 1 oz Platinum Coin from JM Bullion. Issued by major mints including but not limited to the United States Mint, Royal Canadian Mint, and the Austrian Mint! Contains 1 Troy oz of .9995 pure platinum. Bears a face value determined by the issuing mint and nation. Obverse and reverse designs depend on mint of origin. Please note that purchasing multiple coins could result in receiving several of the same condition, style, and/or date. In this JM Bullion listing, you have the chance to purchase a random 1 oz platinum coin. The coins available to you today are in varied condition, with some specimens in Brilliant Uncirculated condition while others may accept minor flaws from production or from previous handling. JM Bullion cannot promise you a particular coin, set condition, or even the date mark on the specimen you receive. When your payment is processed our warehouse team will select your coin at random. As such, you should note that it is possible to receive several coins of the same condition, design, and date when buying multiple platinum coins in this listing. Examples of popular 1 oz Platinum Coins abound today. 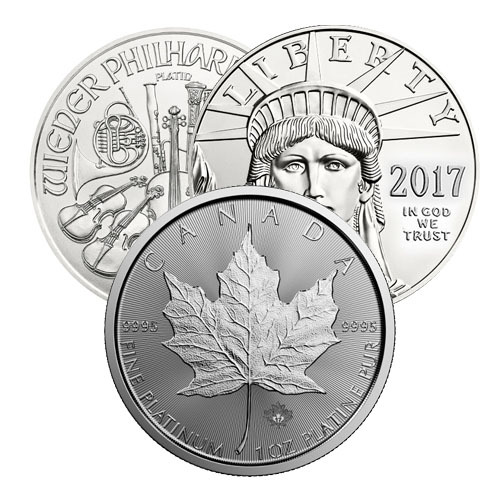 The Canadian Platinum Maple Leaf is one of the oldest platinum coin programs running today. It was initially introduced in 1988 alongside the Silver Maple Leaf and features the same obverse and reverse designs as all other coins in the Canadian Maple Leaf Series. The American Platinum Eagle is another example of a long-running platinum coin series. Introduced in 1997, the American Platinum Eagle is unique in that it has the same obverse design on its proof and bullion versions each year, but the proof series uses inspiring new reverse designs with each passing year. Other examples of major platinum coin programs available in the modern era include the Somalian Platinum Elephant coin from the Bavarian State Mint, the British Platinum Britannia from the Royal Mint of England, and the Austrian Platinum Philharmonic from the Austrian Mint. In the case of each of these coins, the obverse and reverse designs are the same as other metallic versions of the coin in each program. If you have any questions, please feel free to reach out to JM Bullion. Our customer service team is available to you at 800-276-6508, online using our live chat, and via our email address.